Lab orders signed, but labels not printing out. Order was signed in another firm (e.g. Firm D). Look for labels in Firm D’s labs room. Lab labels finished. Look for new roll of labels. They are typically in cupboards in labs room. Printer labels fed incorrectly or jammed. Test ejection of label by hitting button on lab label printer. Manually fix visible label feed issues. I fixed the jam/replaced the label roll, but labels don’t seem to print automatically anymore when lab is signed. For some unknown reason, when the label machine is perturbed, it goes on strike for at least an hour. Go to a downtime form (see below). I’ve tried everything, and still no labels! Go to the patient's chart > Labs > double click to open the labs of interest > click the printer icon. This will print a regular piece of paper at the front desk with the lab information listed. Attach a handwritten label with the patient's name and MRN to the sample. 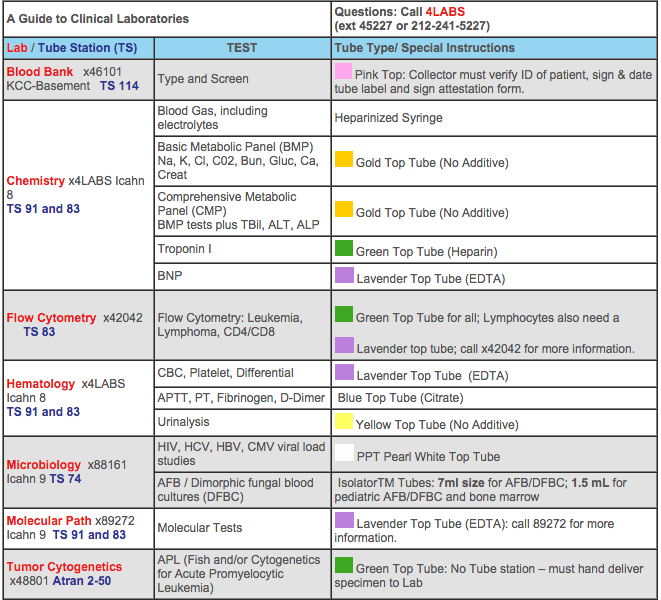 You will have to call 4-LABS or check the tube color chart to determine the correct tube. When handing off labs on Icahn 8th Floor, be sure to communicate that there was a problem. Give each patient their own biohazard bag with the printed lab sheets in the front pocket.